BlueSeal® - It’s what makes No-Flush™ urinals work! BlueSeal® is our long lasting and biodegradable trap seal liquid. 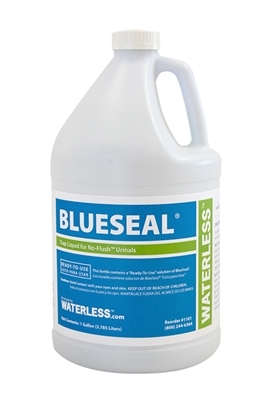 BlueSeal has a specific gravity lower than water or urine. It therefore remains for an extended period of time in the trap with urinal use (small amounts do get carried out with each urinal use), or BlueSeal remains indefinitely in the trap with no use, sealing trap odors. BlueSeal® has zero evaporation at 100 degrees F and does not freeze above -70 degrees F. Then on freezing feature allows facilities to eliminate or reduce urinal winterization costs. Commercially available cleaners will not harm the BlueSeal® in the EcoTrap®. BlueSeal® is simply added in three (3) ounce portions into the urinal EcoTrap® via the PortionAid. Please follow instructions on bottle. Note:The cleaning of Waterless urinals is effected the same way as cleaning conventional urinals. Replenishments of BlueSeal® are simple and accurately measured with a PortionAid. Fill the PortionAid on top of the bottle by simply squeezing the bottle. Pour contents directly into the holes of the EcoTrap®. The PortionAid minimizes the waste of BlueSeal®. Also available in quart size bottles, item # 1114.